Thinking about spring… March was still cold enough for lots of flannel and tweed pieces. The days are getting longer, and we saw quite a few days above 0. As much as I love tweeds, I’m looking forward to the wool and linen blends that I’ll be wearing soon. It feels a bit weird to start off with an outfit that I feel had some areas of improvement. Each time I reflect on this combo, my feelings towards it change a bit. This was the second time wearing these beautiful corduroy trousers from Natalino, and I wanted to push myself out of the comfort zone a little bit. 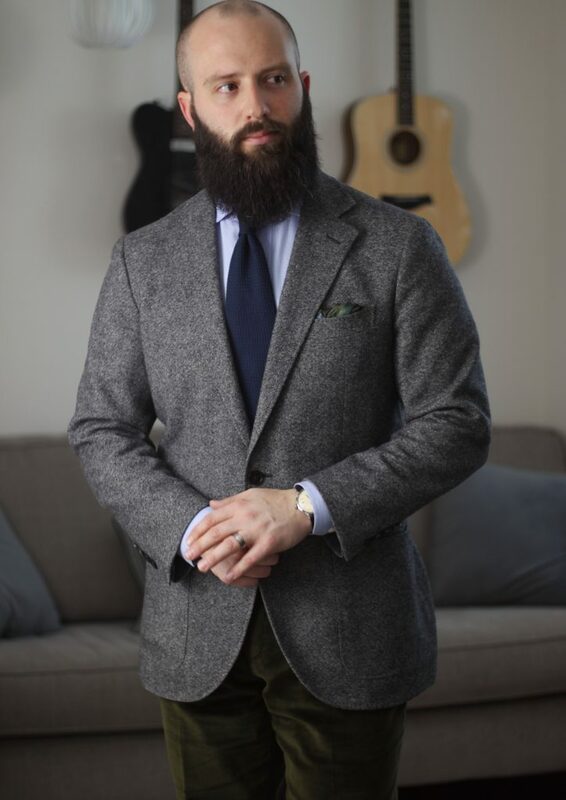 I love how rich and deep the olive colour is on these trousers from Natalino, and I think this grey merino tweed sport coat was a good pairing. The subtle complimentary colours in the Rampley & Co pocket square looks good, but a little more contrast would go a long way. The pale blue shirt and navy grenadine tie are the weak links looking at the first three pics. However, in the close-up image, I feel that the navy grenadine actually works quite well. Maybe a more saturated blue shirt would help? I did try a variation that I think worked well. 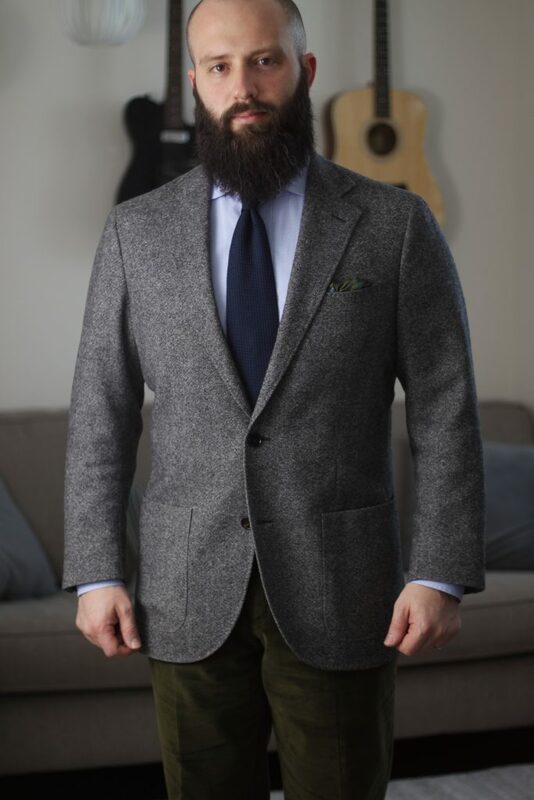 I swapped out the grey merino tweed sport coat for my natural Donegal – it has a predominantly grey tone. 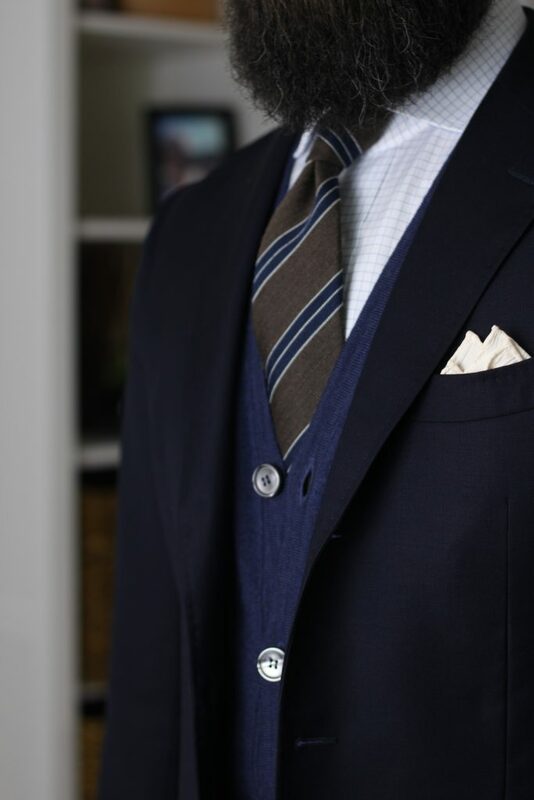 A denim shirt ups the saturation of the blue, and a brown tie strengthens the earthy tones. Trying a similar combo with my ecru shirt will work well, so I might have to try that out. This was a bit of an experiment. 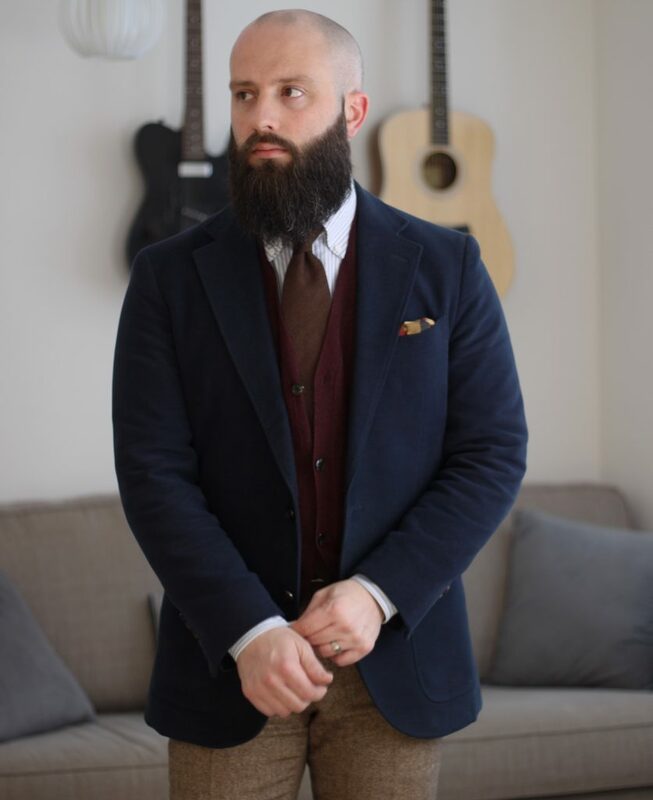 I’ve seen some great blue on blue cardigan and sport coat looks, and wanted to try it myself. 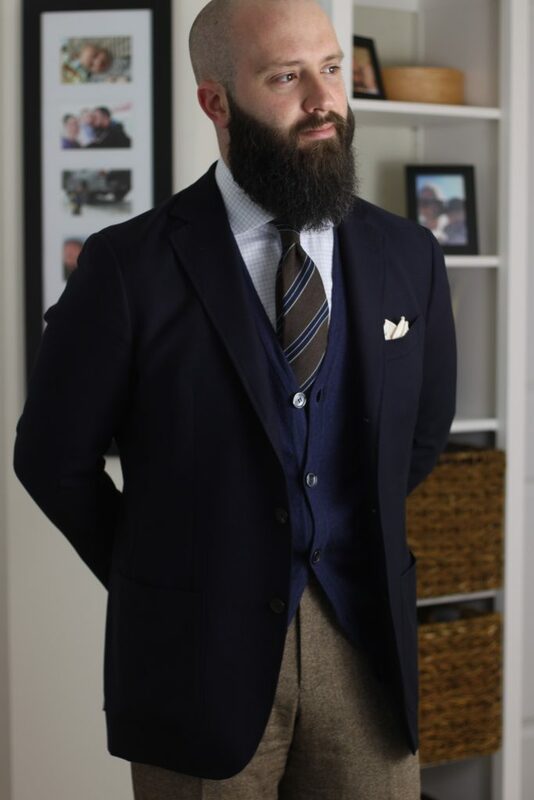 I think this execution wasn’t as good as it could have been with a little more contrast between the blues, and a bit more texture in the fabric of the sport coat. 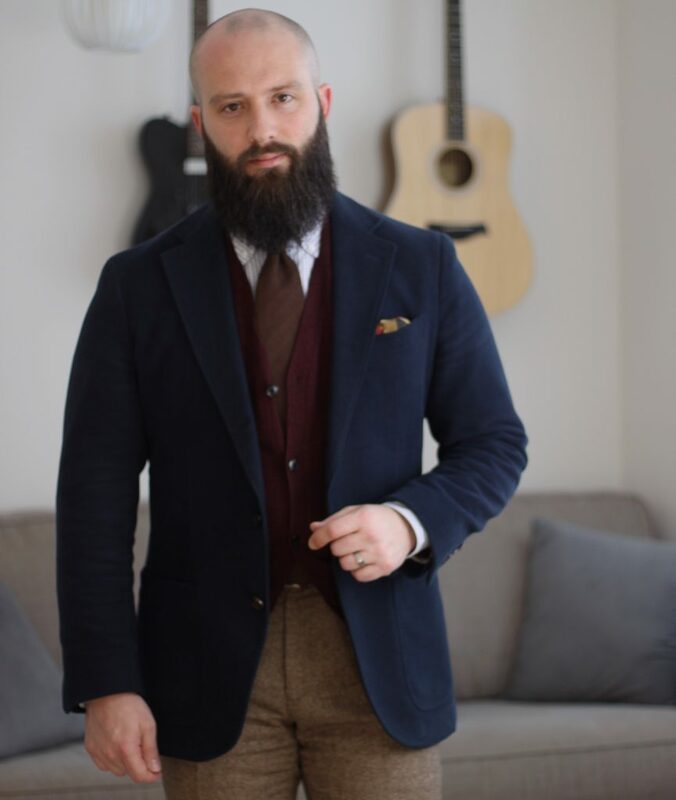 Otherwise, I like how everything played together here – the scale of the checks on the shirt adds just a bit of interest while complimenting the striped tie. Down below I wore my brown merino tweed trousers. 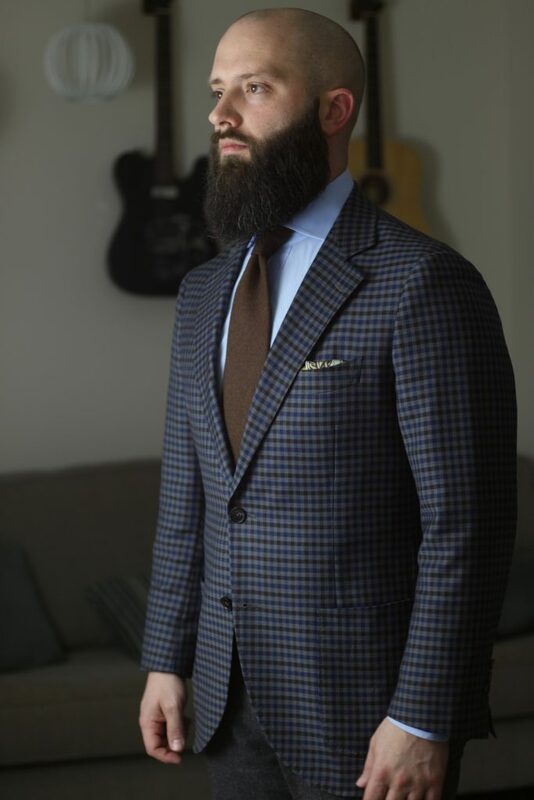 Both the tie and pocket square are from Vanda Fine Clothing (5% off your first order!). 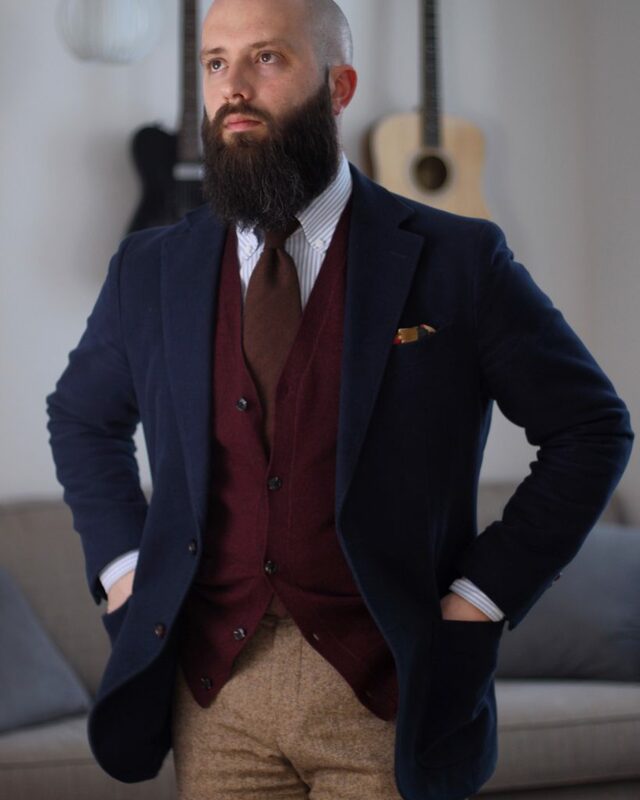 This was a variation on an outfit I quite liked from January that featured a soft, brown cashmere tie from Kent Wang with a burgundy cardigan. 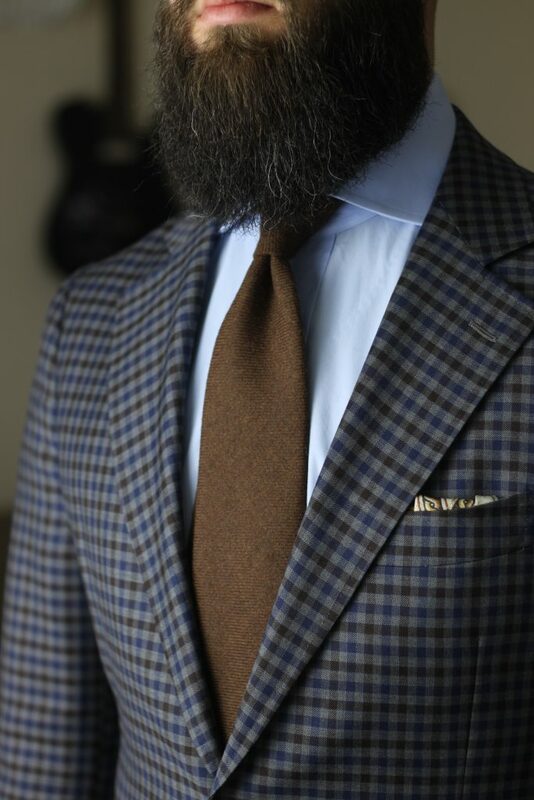 This go around, I paired it with a blue striped OCBD, navy moleskin sport coat and brown tweed trousers. Finishing off with my R.Culturi x Saddo pocket square, called “The Guitarist”. In the previous version, I went with a white OCBD, brown cashmere tie from Rampley & Co, a grey tweed jacket and navy trousers. 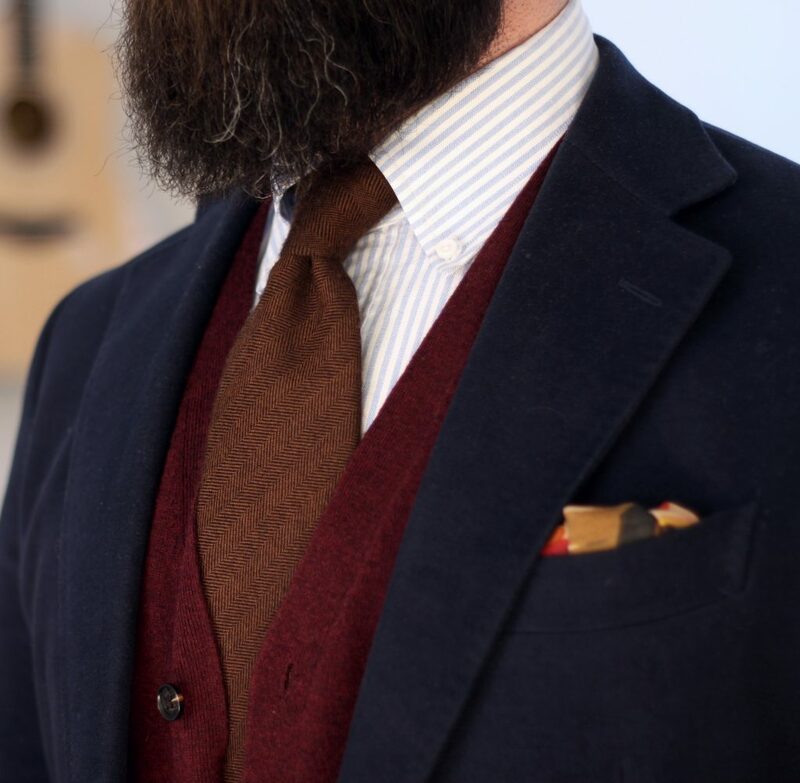 I really enjoy the pairing of brown and burgundy, and both outfits were well balanced. Adding the blue striped OCBD to the first one would have helped to add relevance to the navy trousers. A lighter brown trouser – think sand, or camel – might have improved this one. Though, with all the dark, saturated colours up top, the balance would have been shifted upwards. Safe plays are good sometimes. 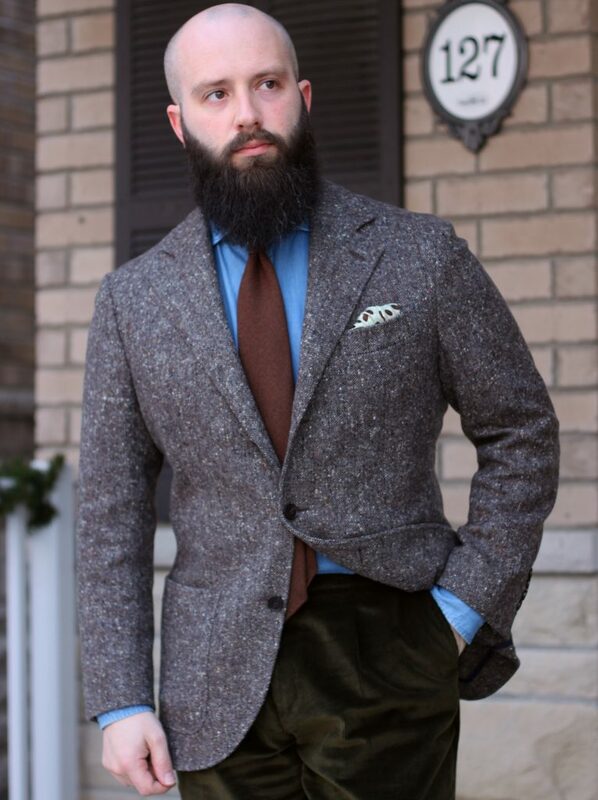 This outfit it fairly simple, using pieces that are all complimentary, sharing three colours – blue, grey and brown. 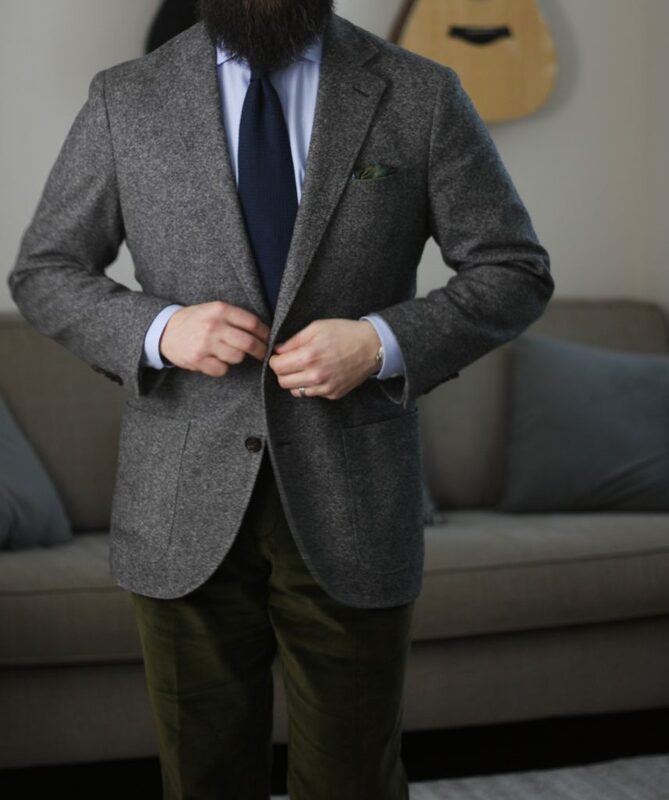 I really love the fabric on this jacket, and have found it to be a versatile sport coat. Pale blue shirt, soft, brown cashmere tie and mid-grey flannels kept it seasonally relevant, and coherent. In my pocket is the Lod Mosaic pocket square from Kent Wang, which adds an extra element of the colours present throughout the rest of the outfit. 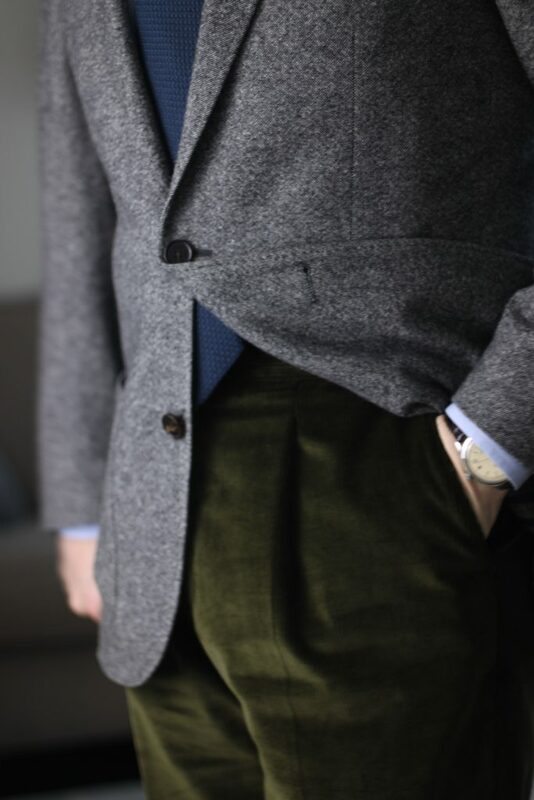 A lighter grey flannel trouser would have improved the contrast, but I like how there isn’t a strong definition between top and bottom, aside from the added colours in the pattern of the jacket. When I started writing this post a couple of things came to mind. First, I hadn’t posted much this month due to real life events (busy at work). Second, what I had posted wasn’t all my best efforts. I reminded myself of why I started writing this blog, which was to take an honest appraisal of what I wear, and to think about why I made the choices I did. So, I hope you enjoy my thoughts, criticisms and praises of what I wore this month. Disagree? Have your own thoughts to share? Let me know in the comments!